Staying on-site at Leeds Bradford airport is a great option for all of our customers. The car park is so close to the terminal transfers aren't needed. Once you have parked it's just a 2-3 minute walk to check-in.Being an official, on-site car park means the security measures in place are second to none. On-site car parks are often labelled as being expensive, however, when you book with Holiday Extras you can save up to 70% off the price you'd pay if you just turned up. 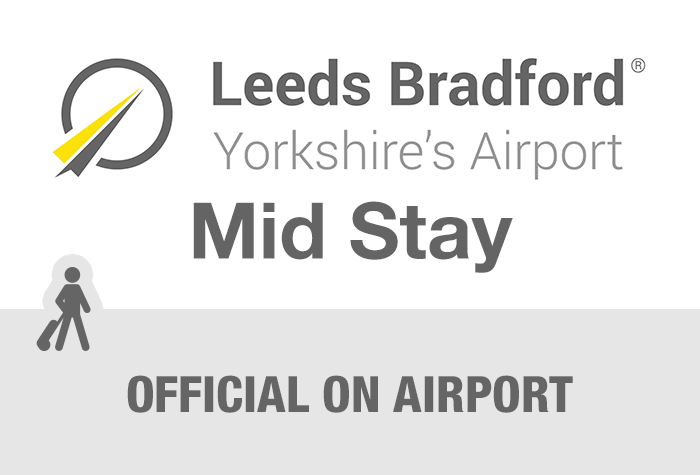 If you're after a car park that saves you valuable time and kick starts your holiday, then Mid Stay is the Leeds Bradford airport parking option for you. Stay at this award-winning car park and you won't need to worry about transfers - check-in is just 3-minutes away! Mid Stay gives you a stress-free parking experience. It's highly convenient, got fantastic security and is simple to use. When you arrive at the car park, drive up to the barrier and your car registration will be recognised and lift to let you in. Then, you just need to park in a space, unload your luggage and walk the 3-minute journey to check-in. There are no other transfers to worry about, so you can save time waiting and travelling, and this makes it ideal for disabled travellers too. As you leave, make sure you keep your keys with you. While you're away, your car will stay exactly where you left it, in the Mid Stay car park. The car park has award-winning security, with CCTV, barriers and regular security patrols, so you can rest assured that your car is in good hands. When you get back to the UK, collect your bags and walk back to the car park. Find your car where you left it, drive to the exit and the barrier will let you out. Then you're free to head home. It's a no-fuss, super-simple parking solution. If you're after one of the closest car parks at Leeds Bradford airport, then book Mid Stay today and you're guaranteed to get the best price available. Accessibility: - Blue Badge spaces are available on a first come first served basis, you just need to have a copy of your badge visible in the car. If you stay longer than your booked time, you'll be charged at a rate of £10 a day. The car park can't take cars taller than 1.9 metres or wider than 2.5 metres. Transfers aren't needed, it's just a short 3-minute walk to the terminal. The on-line instructions were wrong taking us into another car park that we had to pay to exit. There was little signage to help us locate the airport. This was required as there is a lot of building work taking place. The mid stay car park had signs going to two different places. It appears to have been relocated. So after following the wrong signs, we were advised to follow the others. After arriving at the correct location, the barrier lifted and I parked. On return I drove towards the barrier to leave and found a large queue.There were two exits but one was coned off. The number plate camera was not working at the other so everyone had to press the button to speak to someone. I had the barcode from my booking with holidayextras ready on my phone to use as instructed by the email if the camera was not working. However my phone, (standard size ) would not fit under the scanner so I had to call to be let out too. Access to the car park had been changed due to construction work also parking spots were difficult to find and very tight! We were not informed of change of access route which would have been helpful. Could do with better signposting to car park and from car park to terminal but apart from that it was fine. Our customers rated Mid Stay Parking on average 9/10 (303 reviews). Read Mid Stay Parking reviews.